As I sit here brewing up a double IPA of my own, with nothing better to do but play on my iPhone, I figure I may as well post about the beer I’m drinking. No need to extoll the virtues of Founders Brewing. Look through the pages on Aleheads and you’ll see that they f’ing rule. What I have here is their Triple IPA, whatever the he’ll that means. For 112 IBU’s, the nose doesn’t present a ton of hops. Malty sweetness and plenty of booze though. Taste on the otherhand is where my face caved in on itself. If I had to speak, it would be from a puckered up void where my lips used to meet. So hoppy that it doesn’t taste hoppy anymore, as if that makes any sense. Drinkability depends on if you want to taste anything ever again, or if you like blacking out and waking up under the dining room table. One is plenty here, but I could be convinced to put down another if I had it. With a beer like this it’s tough to rate because I know very few people will enjoy it like I did. 3.5 hops from me – I think whatever they were going for it worked. Now I better get back to my boil before my brew conquers the stovetop. 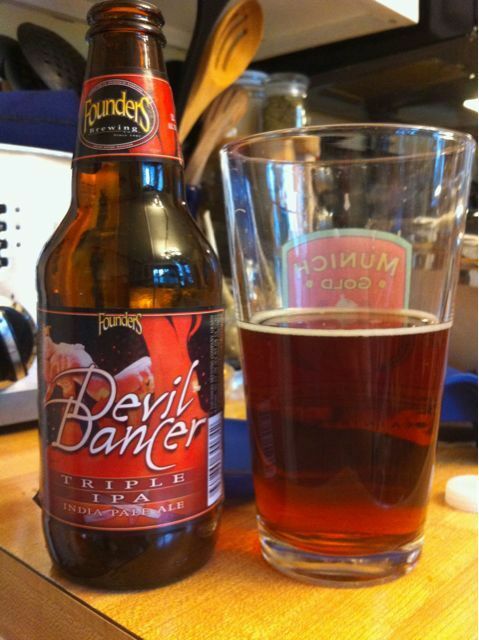 Posted in Tasting Notes.Tagged Devil Dancer, Founders, triple ipa. Had this on tap in Atlanta. Like every other Founder’s offering, it’s both remarkably complex and shockingly drinkable. I actually didn’t find it to be overly hoppy at all. Maybe being on draft changes the complexion a little, but I found the taste and particularly the finish to be very smooth (not nearly as bitter as I expected). Just another incredible beer from arguably the best ale factory in the US.